Everybody is talking about KFC’s Double Down burger, which has just made it’s way to the UK and has become a bit of a phenomenon. People have been posting to social media with their own thoughts on the bunless burger and you can’t walk down the street without seeing a handful of billboards advertising the thing. But, of course, there were a certain group of people who couldn’t try the meaty beauty, but thankfully vegans now have the chance to get their hands on a very special version of the Double Down. The good folks over at Temple of Seitan have created a cruelty-free concoction of chickenless heaven. The burger is comprised of vegan cheese, vegan bacon and two fillets of Seitan’s very own crispy delights, served with BBQ sauce. It’s on the secret menu at Seitan’s, which is why we’re doing the good thing and spreading the word for you. Go forth and eat plant-based chicken! Pushing the boundaries of what we know to be a burger, the Double Down sandwich consists of a hearty helping of bacon, Monterey Jack Cheese and BBQ sauce, wedged between two of KFC’s iconic chicken breast fillets. Need a double down burger in my life ASAP ? ? ? Hailed by many burger aficionados as the world’s best fast food sandwich, the Double Down has already gained a die-hard fanbase across the USA, Australia and New Zealand. The delectable Double Down is now available in stores across the UK, for a perfect six weeks before disappearing once again into whispered folklore. That new double down burger in KFC is ???? Fandom has gone wild over the past few years on social media, and we’ve even had reports of our customers taking things into their own hands by hacking the menu to create the sandwich. People have been so enamoured with the delectable culinary invention of KFC’s mad professors, they’ve been taking to social media to wax lyrical about the taste sensation. Some people were even queuing outside of their local KFC branches on opening day, which is totally understandable. I had a KFC double down today – believe the hype – they’re f*cking incredible. Blimey. 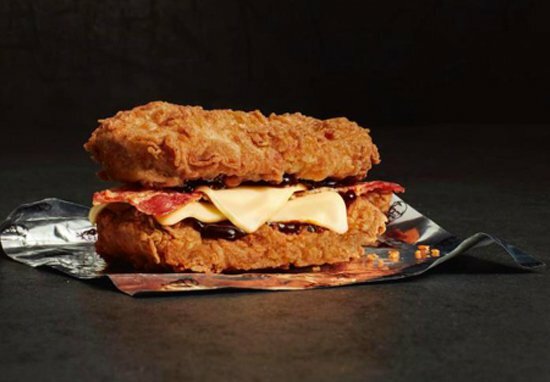 Whether or not the Double Down will solve all our problems is yet to be confirmed, however, it looks pretty certain this will make an extremely tasty addition to KFC UK’s menu.